Is Greenwich really in Inner London, asked the first commenter on yesterday's IKEA post. And yes, officially it is, according to the London Government Act 1963 which established Greater London. Here's a map of Inner London. The twelve official Inner London boroughs are Camden, Greenwich, Hackney, Hammersmith and Fulham, Islington, Kensington and Chelsea, Lambeth, Lewisham, Southwark, Tower Hamlets, Wandsworth and Westminster (matching the extent of the County of London which existed prior to 1965). Along with the City of London these form the statutory definition of Inner London. The Mayor's London Plan adds Newham. The Office of National Statistics, when data-bashing, adds Newham and Haringey but removes Greenwich. Outer London is the remainder of Greater London outside the coloured area. It's by no means an ideal demarcation, but the 33 boroughs aren't easy to recombine. If you wouldn't do it like that, or are a confirmed boundaries pedant, here's a comments box to discuss the alternatives. The historic quirks that have led to this arrangement mean that some of Outer London isn't particularly outer and some of Inner London isn't particularly inner. Taking the centre of London as Trafalgar Square, I've located the point in Outer London that's closest to the middle and the point in Inner London that's furthest away, and then been out to visit these extremes. Here's my report from inner Outer London and outer Inner London. The official centre of London is in Westminster, a borough which touches just one Outer London borough, namely Brent. And it's where Brent nudges into Westminster, around the Kilburn/Maida Vale discontinuity, that we find the innermost part of Outer London. Shirland Road is a long street of tasteful Victorian villas, stretching from almost Little Venice to pretty much Queen's Park. It's all in Westminster, apart from a brief 50 metre stretch where a tongue of Brent licks down from Carlton Vale. Here it is. 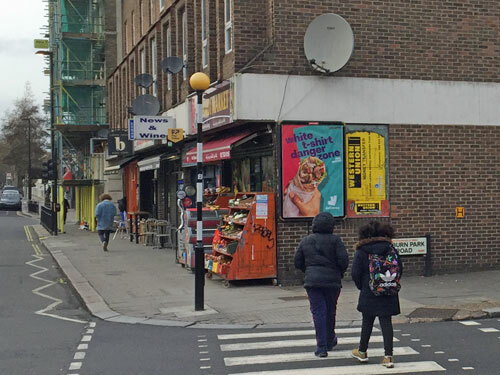 The boundary swings in along Kilburn Park Road, cuts across this short shopping parade and a former pub, nips over Malvern Road for precisely three more shops and then heads back north between the backs of houses. What's peculiar is that this tiny stretch of border has a kink in it, bending inwards along the line of a hedgerow long since obliterated by a more rigid streetplan. And that means that 197 and 199 Shirland Road are in Brent, 201's in both boroughs, 203-207 are in Westminster, 209 is back in Brent, 211's in both and 213 onwards are in Westminster. It makes local planning applications fun, which is where I found this map. The numbers are my addition. The zebra crossing outside 197 Shirland Road contains the innermost point in Outer London, which until the mid 19th century was the spot where the River Westbourne was joined by a short tributary from Queen's Park. Today 197 is occupied by Alwadi Market, a grocery shop that also sells Halal meat, and boasts a copious array of fruit and veg out front. I can confirm that the innermost vegetables in Outer London are red onions, squash, carrots and okra, and the innermost fruit would be pineapple but that tray's empty. You can see this isn't the original building, the shopping parade got rebuilt with flats above it a few decades back, before which the diagonal borough boundary would have made a little more sense. 199 Shirland Road is an utterly generic inner city newsagents, except it's in Outer London, offering lottery, Lycamobile and Oyster services. It even claims to sell Stationary on its shop front, that's how utterly stereotypical it is. 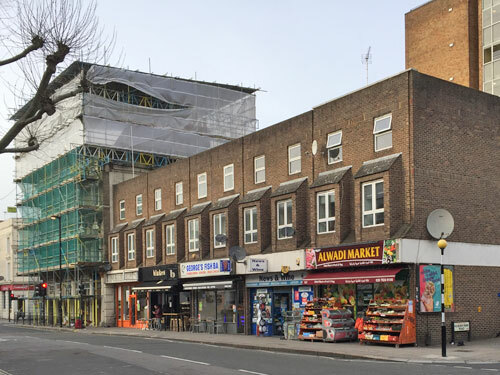 George's Fish Bar and kebabbery is the split-borough property at 201, whereas Blakes bakery nextdoor looks every inch the swish Westminster eaterie it accidentally is. Washing your smalls in the nameless laundrette at 205 is an Inner London activity. Meanwhile the Chippenham pub at 207 is now an 11-room hotel, and enlarging itself as we speak - Brent's Head of Planning had no objection. Step behind the parade and a rather more modern landscape emerges, all of it in Brent. John Ratcliffe House is a utilitarian block of flats, the letters of its name inexorably coming adrift. What used to be the doctor's surgery on Malvern Road has been recently replaced by nine generic brick apartments, inexplicably labelled outside as belonging to the borough of Kensington and Chelsea, as if this area weren't complex enough. The former Post Office and social housing beyond are boarded up and awaiting renewal. Buses terminating at 'Maida Hill, The Chippenham' pull in here. On the local community noticeboard, Barry hasn't updated his Safer Neighbourhood meeting notes since January 2014. It absolutely doesn't deserve to be Outer London, but it unequivocally is. The borough of Greenwich spreads a long way east, past Woolwich, past Plumstead, right up to the heart of Abbey Wood. I was expecting Thamesmead to be the edge of Inner London but no, it's beaten by an open space a couple of miles south in the West Heath area of otherwise-Bexley. 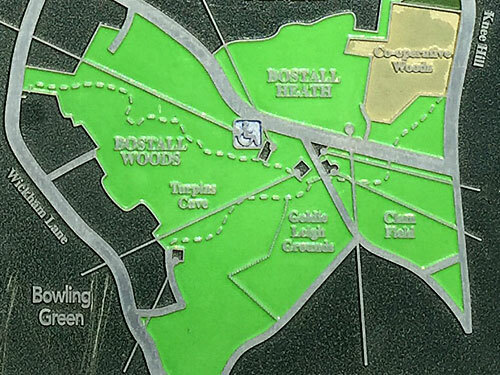 For orientation purposes climb Bostall Hill through Bostall Woods to Bostall Heath, an extensive undeveloped ridgetop expanse of acid-soiled heathland. It's not a common ecosystem, especially in London, so full marks to the Metropolitan Board of Works for protecting over a hundred acres from development as early as 1877. In 1894 an additional slice called Clam Field was added to the protected area (nothing to do with crustaceans, but admission that the soil was damp, cold and sticky). During the war Clam Field was taken over for a battery of anti-aircraft guns, but since then has been used as an enormous recreation ground, with cricket nets and a bowling green in one corner, and dogs and joggers around the edge. Originally bounded by two country lanes it tapered gently to a point at a boundary stone in the midst of open fields, marking the point where London morphed into Kent. And while the land on the outside of those country lanes has been turned into housing, with Bexley's bins out front, the inside of the triangle remains resolutely open, and still in Greenwich. 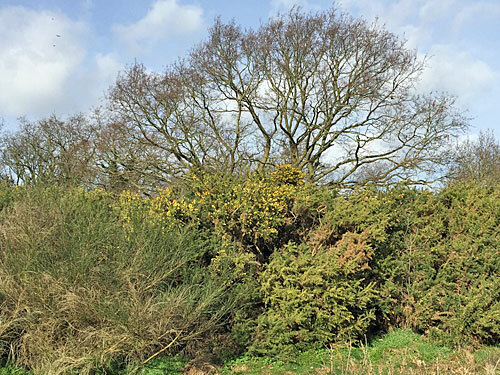 At the very tip of the triangle, cut off by West Heath Road, is an overgrown section of grass and gorse thicket with a brief footpath weaving through. It's just large enough to be noteworthy, and just secluded enough that adolescents could get up to all sorts unseen by their parents watching from semi-detached windows across the road. A clump of burnt tree trunks suggests this is exactly what some of them have done. For fire and anti-social behaviour-reporting purposes, the emergency services have designated this particular zone 'Gold 8'. The yellow of the gorse adds a bit of winter colour, various discarded drinks cartons add some more. Step out to the far end and the heath draws to a halt beside a litter bin and a somewhat faded information board. A Give Way sign marks the tip, then a BT inspection cover, and standing on that is like looking out from an Inner London headland surrounded by an Outer London sea. The precise point where the boundary stone once stood has disappeared beneath the hatched lines down the centre of Brampton Road, and would have been a little further down opposite number 300. 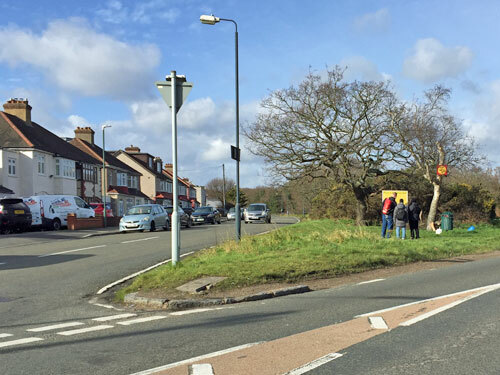 The edge of Greater London is barely three miles distant, across the comfortably suburban estates of Bexley. It absolutely doesn't deserve to be Inner London, but it unequivocally is.